A goal each from Anthony Wolfe, Ansumana Kromah and Surabuddin Mollick helped Churchill Brothers to register a comfortable 3-0 win over DSK Shivajians in the I-League match played at Tilak Maidan, Vasco on Sunday. Derrick Pereira was a happy man after the Red Machines looked rejuvenated following the 4-5 defeat against Minerva Punjab in the last match. “It was a much-needed win. The boys responded well and showed that they were well organised in defence. We created some good chances in the first half but the second half was better where we scored excellent goals. 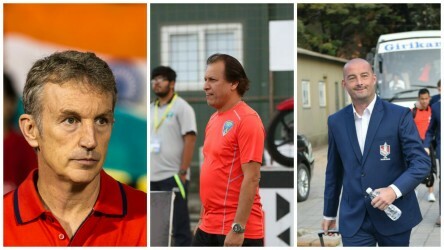 I am very happy and pleased with the players' response and we will try to do better,” Pereira said. However, he feels that the mission is not complete yet and he will continue to do his best in the upcoming matches. “A win is always a win. The next match is against Mohun Bagan, and it will be the same if we win against them as well. Whereever I go, I give my 100 percent. I do my job and in return, I get what I have to get,” the 54-year-old said. 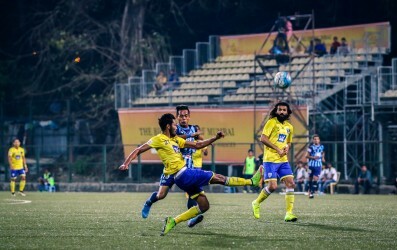 The Goan tactician gave a first start of the season to keeper Naveen Kumar as he benched Alfred Fernandes' first choice custodian Priyant Singh. “I felt Priyant (Singh) was a little low on confidence after the last match. I know Naveen (Kumar) from Salgaocar as he has played for them in the local league and I thought he would be better as he comes out for crosses which was much needed today as they (DSK) play long and I expected tall strikers today. Naveen is good in the air and he performed to my expectation as he gave a lot of confidence to the defence,” he concluded. On the other hand, Dave Rodgers was disappointed with the performance of his boys and said, “I knew Derrick would be fired up. For our boys, that is probably the worst performance till now. No excuses, no excuses whatsoever we were well beaten in the second half. However, he did not forget to praise their academy product Pranjal Bhumij who made his debut yesterday. The midfielder was lively after coming in for Naro Hari Shrestha at the hour mark.